Three-dimensional drawings on asphalt and paper have become incredibly popular among people of all ages in recent times. Vivid and lifelike, they are dazzling. 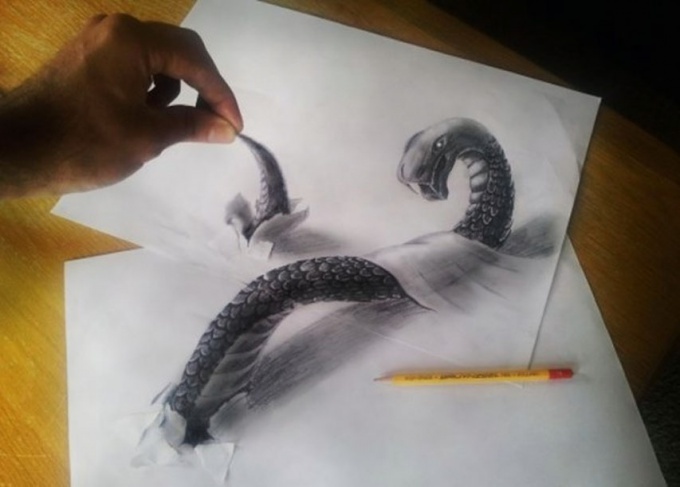 It is therefore quite natural that many people want to know how to draw on paper 3d drawings. Learn to draw 3D drawings on the pavement or the paper may every aspiring artist. It is necessary to follow simple tips. To become a 3D artist, try to learn how to draw simple three-dimensional figures. Ideal for the beginning to try to draw a cube, sphere, pyramid, star, cylinder, cone. Then move on to more complicated subjects. Often in art schools after geometric figures learn to draw the dishes and fruit. To make 3d picture, carefully examine the shape of the depicted object, all of its bumps and hollows. See how the light falls. Certain parts of the shape rather dark, the other bright light is falling, and they give a bright glare. Don't forget that any object casts the shadow. Learn to draw 3D best simple pencils with different hardness. It is better to buy a special set. Soft pencils give a more dark and thick lines, solid paint thinner and lighter. Also, to obtain three-dimensional image it is necessary to strengthen and weaken the pressure on the pencil where it is needed. To get a good picture beginner 3D artist need to choose the right kind. For this you can use a real object or a photograph of good quality. Don't try to draw very complex plot. If you have mastered three-dimensional figure, try to portray in 3D some mystical creature or a comic book character. In the first stage create on paper sketch. It should be a flat image. Next, determine which side the light falls. If you have multiple light sources (e.g. artificial and natural lighting). So at first it was easier to work with make inclined lines of light in the form of a grid. Keep in mind that some of the objects your story could obstruct others from the light, and then they will become darker. This will allow you to properly draw a 3d picture of light and shade. When you have sketched on paper with a pencil sketch, start drawing the shadows. They give the 3D volume. To do this the easiest way layers. So the light parts and light picture will is not shaded, a little more shaded items will be shaded in a single layer, and almost black elements will receive the greatest number of layers of shading with a pencil. So nice and neat to draw 3d drawings on paper, it is important to choose the right sheets for creativity. The thicker the paper and the more gloss, the more realistic will make a good picture. To make a 3D picture closest to the present picture, it is not necessary to trace any contour lines. This plane pictures turn out beautiful, if you add clear contours, in real life objects have when transferring them to paper more than vague outlines. Same applies to shadows. Extra volume effect to help shape the eraser. To draw more complicated 3D pictures on the asphalt art experience will not be enough. It is quite complicated and time-consuming process. Professionals also use special programs: After Effects and Adobe Photoshop. To make a three-dimensional drawing on asphalt, find a comfortable place and take a picture of it. Open the resulting photo in the editor Photoshop, add the image you want to draw in 3d. Apply a filter. Then correct the perspective so that the picture has a grid. Export the resulting image into the program After Effects. If the operation was correct, then the result will be the emergence of the computer three files in vpe, 3ds and png formats. Open the file with a png extension and you will be able to see your 3D figure on top. Make a printout on a color printer. For a picture to be more clear, it is desirable to use laser models and photo paper. Drawings in a 3d drawing on the pavement with cans of spray paints or crayons. The difficulty in using the first is to find a large number of shades. And cans to learn how to draw 3d drawings on the pavement is quite difficult. To spray the paint more thin streams, you can use the airbrush.